These are some snapshots and a very brief narrative of how the mission unfolded. 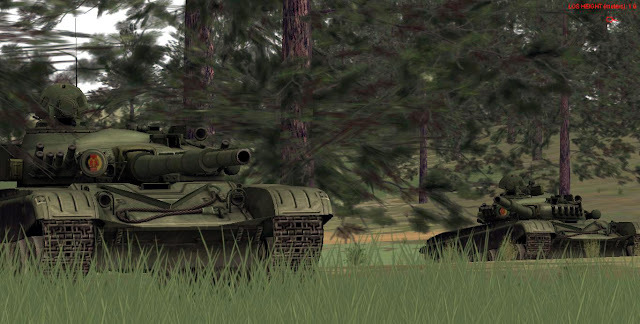 The T-72 M1 proved to be more than adequate for this mission. At the risk of being repetitive, I will re-post the tactical plan from the previous entry. We are currently at ABF position "East". We will expend half our ammunition from our current position to soften up the enemy position (enemy bunkers and BMPs) and then move into positions "South" and "West" sequentially to finish up the remainder enemy forces. At ABF "East", in hull down positions. Final seconds before opening fire on the enemy camp (far background treeline). 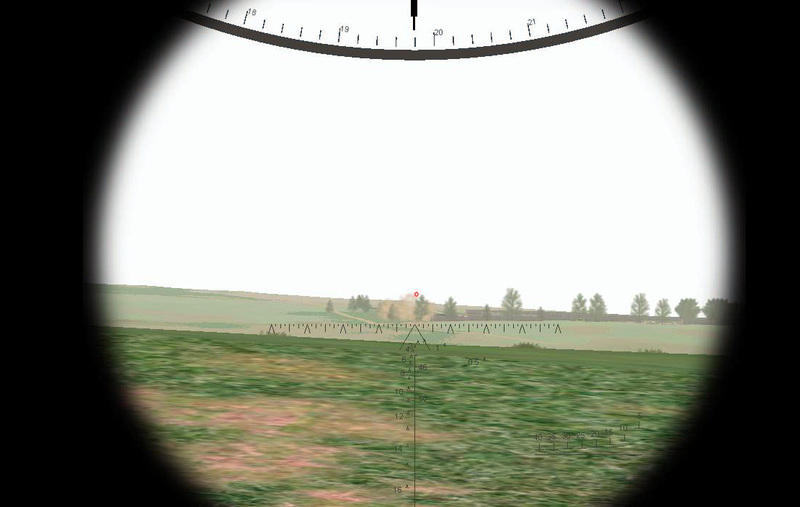 Gunner's sight view. Taking out one of the two enemy infantry bunkers outside the perimeter of the camp. Both bunkers were destroyed. 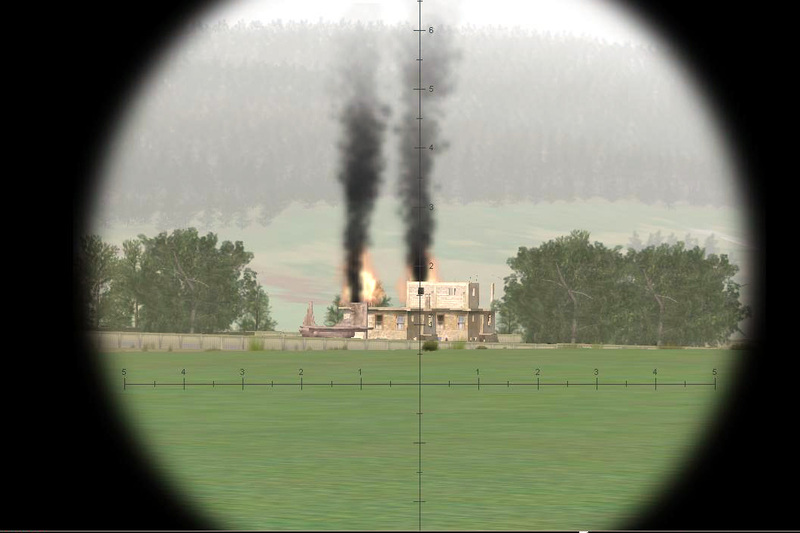 We fired a couple of rounds into the building/barracks and we set them on fire quite quickly. 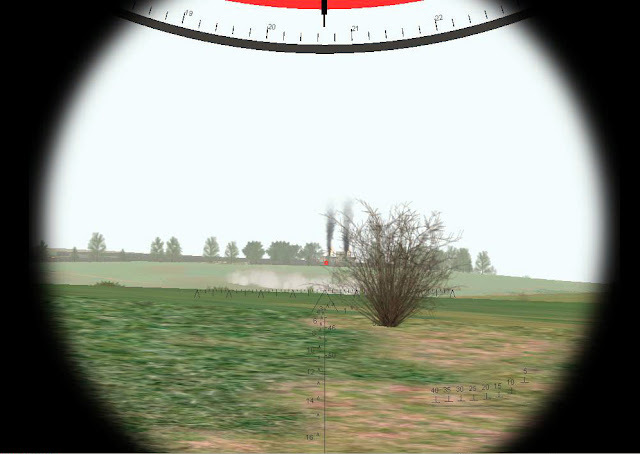 The smoke screen in front of the enemy camp is likely from an enemy BMP that was struck by the shrapnel of our fire. 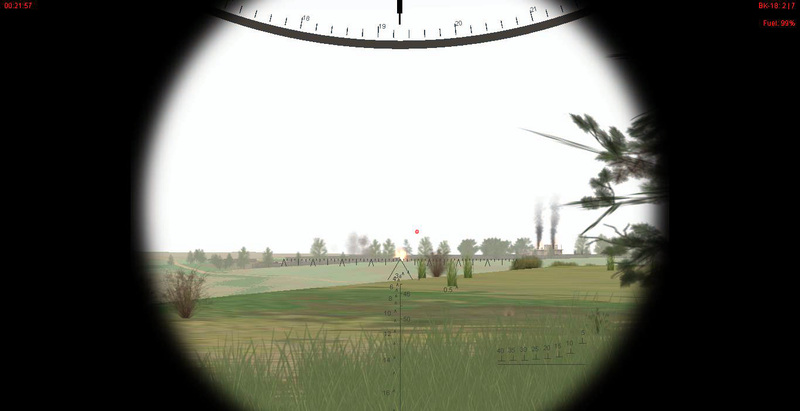 As I mentioned before, firing from the T-72 M1 requires some time with the eyes out of the gunner's sight. The gauge that the cross is pointing out is for the ammo and allows the gunner to see how much ammo rounds of each type are left. The walls of the camp block our vision of the troops inside of it. 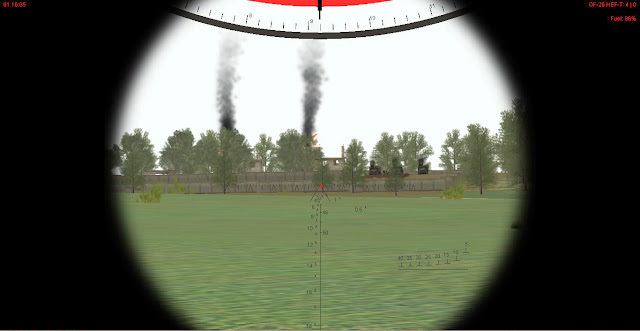 With a bit of practice, we were able to take advantage of the arched flight path of the high explosive rounds, landing the shells inside the camp. We pummeled the camp con gusto, hoping we hit something. The enemy BMPs fired at us with their cannons and this allowed us to get a visual cue about their location. Eventually, one of the BMPs fired an anti-tank missile, which flew overhead. We had to use smoke and wait until it dissipated before re-engaging these vehicles. There were no explosions accounting for destroyed enemy vehicles, but their fire came to a sudden halt after our shelling. We then went back to cover and reloaded our ammo. It was time to move out to our next ABF position "South". Our not-so-covered approach to ABF "South" was a disaster. From a 2 Km+ range an anti-tank missile came in our direction. I had the platoon in a halt to consult the map. My gunner or somebody in the platoon network was warning me about targets. I thought that given our distance, their LOS to whatever target would be narrow like a pin, so I moved the tanks a tiny bit forward. When I realized about the enemy fire, it was too late. 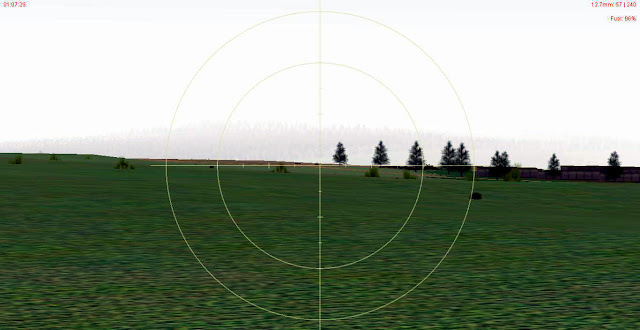 Never take your eyes off the target! Our approach towards the ABF position "South" was extremely slow. Fortunately, the smoke from the smoldering buildings at the camp allowed me an easy navigation. 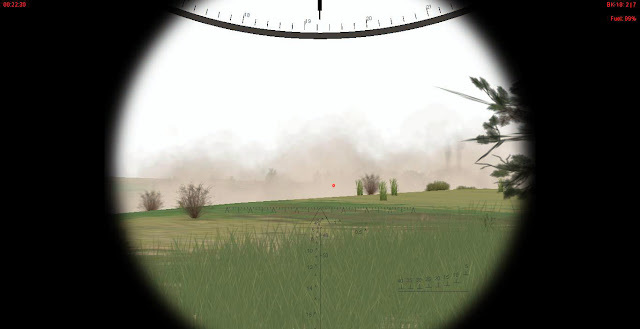 Gunner's sight view from ABF position "South". Note the close range (900 m, no room for mistakes now). 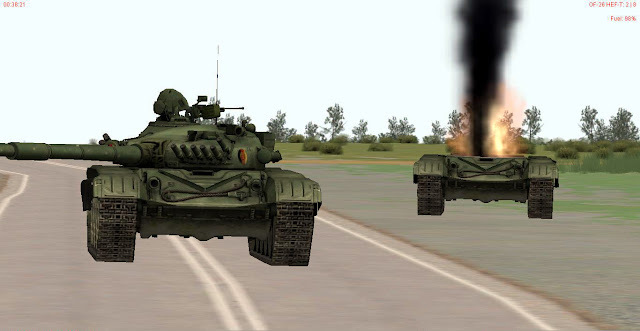 Three trucks are on fire and one BMP destroyed. There were no troops visible at the buildings/barracks. We fired some high explosive rounds inside the camp to neutralize infantry teams, but nothing was visible. 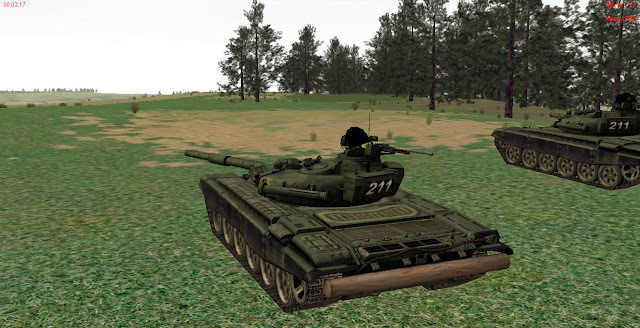 On the south-west corner of the camp, outside the perimeter, there was a dug-in BMP supported by infantry. 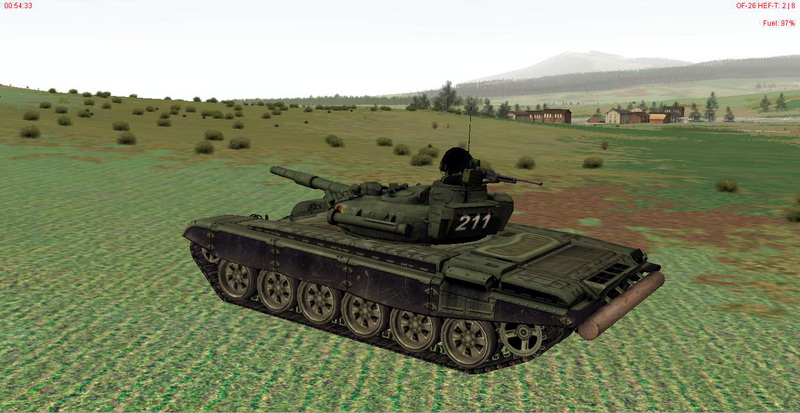 The BMP was likely destroyed from our previous position (?). We engaged the troops with the commander's heavy machine gun, but cranking it manually was a bit of a drag. Very powerful, though. 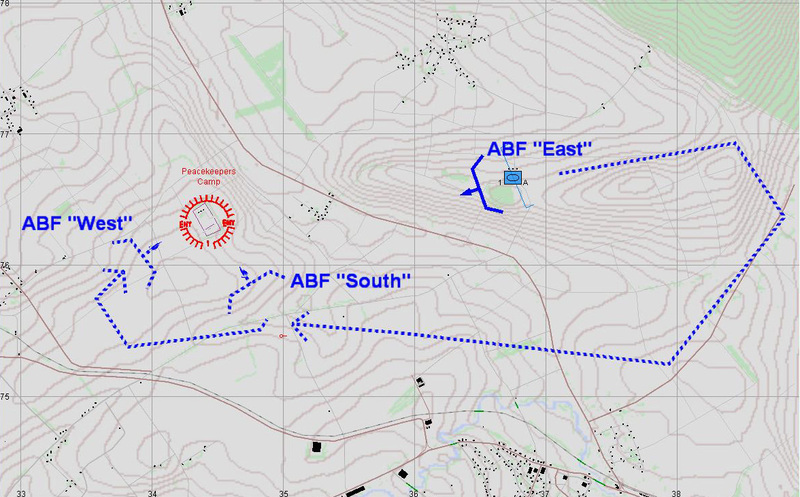 We were seemingly out of targets and ready to move into ABF position "West". With the hopes of getting a better angle of fire against any remaining targets. Commander's binocular view from ABF position "West". In full view of the burning building/barracks. The range is now extremely close. Contrary to our expectations, the "ridgeline" we read from our observation position back at the beginning was more like a flat hill with a gently slope leading to the camp. No targets visible. And here is my second mistake, which almost ended up in another catastrophic loss. 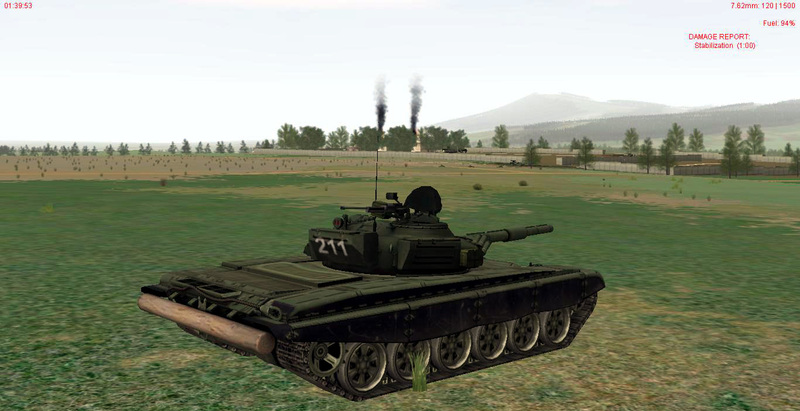 I moved one tank forward from ABF position "West". There was infantry still willing to put a fight and I took one RPG to the nose. 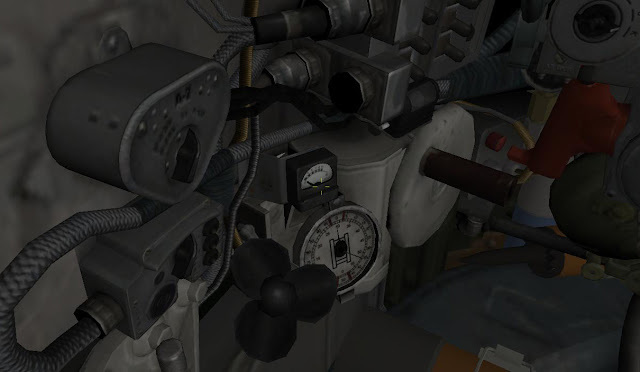 Fired the coaxial gun like there was no tomorrow, but my main gun lost its stabilization. Then I called the mission to an end. There is a lot to write about this. Stay tuned for an AAR that will show what we hit and what we missed. No offense here but this Blog focuses more and more on Arma and SB. Iam missing Strategy games like Command Ops. JC I feel your gaming pain: I cannot tell you how many games that I bought that are still in the shrink wrap. I will be lucky if there is still patches available for some of them! Did you figure out the scoring yet for your mission? Hi RangerX! Good to see you back online again. Anonymous: Nope. Want to try? :) e-mail me at realandsimulatedwars at gmail dot com.